New York City Police Sgt. 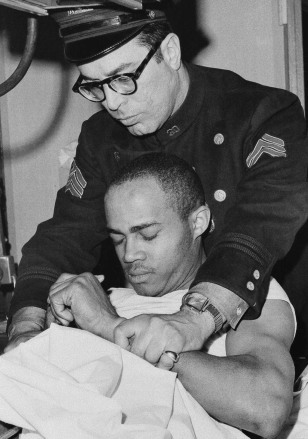 Alvin Aronoff, left, grips hands of Thomas Hagan in the emergency room of Jewish Hospital in New York on Feb. 21, 1965, Hagan was wounded earlier that day. Hagan, one of three men convicted of killing civil rights leader Malcolm X, has been granted release.